More than 30 Indian passengers, some bleeding from their noses and ears, have received treatment after pilots "forgot" to turn on a switch regulating cabin pressure, officials said. Lalit Gupta, a senior official of India's aviation regulator, the Directorate General of Civil Aviation (DGCA), told the Hindustan Times newspaper that the crew had forgotten to select a switch to maintain cabin pressure. 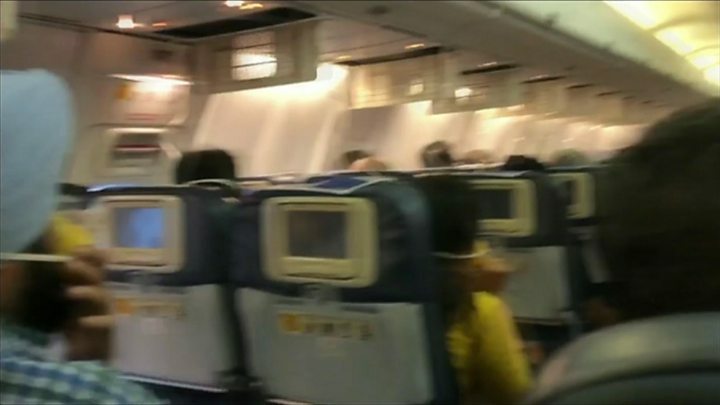 Passenger Darshak Hathi tweeted a video of the interior of the cabin as air pressure dropped and oxygen masks came down. Another passenger Satish Nair tweeted a picture of himself bleeding from the nose, and complained that "the safety of passengers had been completely ignored" by the airline. In January, Jet Airways grounded two pilots following reports of a fight inside the cockpit of a flight from London to Mumbai. The flight, which was carrying 324 passengers, had landed safely.